AMARILLO, TX - Sometimes the best news and important events in your life happen very quickly. Amarillo Bulls defenseman Marcus Chorney knows something about that. In a matter of a few days, Chorney made his decision of where he will be going to school for the next four years. The Bulls announced today (Friday) that Chorney has committed to Quinnipiac University (ECAC Hockey) and be the first player from the Bulls to attend the school. The Hastings Minnesota native is the 6th Bulls player on the 2017-18 Roster and 14th overall to make his NCAA plans. "It's obviously a great school and Rocky (Bulls Head Coach Rocky Russo) had a lot to do with it," said Chorney. "The Qunnipiac Coaches called me in Dallas and told me about the school and when I went to Detroit (for NAHL Top Prospects) they made me the offer. It happened real quickly." "It's a huge honor to be committed to a school like that, and to go Division I which was the goal from day one." Chorney arrived in Amarillo late last season and this year was named one of the Alternate Captains. In 65 games with the Bulls, the 6-0, 185 pound defenseman has seven goals and 19 assists for 26 points. Chorney has been a big part of the Bulls special teams and has 10 power play assists and a vital part of the penalty kill. Amarillo Bulls Head Coach Rocky Russo is thrilled about the news regarding Chorney. "We are extremely proud and excited for Marcus and his family," Russo said. "He has developed his game throughout the year and earned this opportunity." Russo said that Chorney is a great teammate and role model for the younger players. "Marcus sets an example for his teammates both on and off the ice, while consistently maintaining a tremendously high compete level," he said. "There is no question that he will be a tremendous addition to Quinnipiac University both on the ice and in the classroom." Chorney said the Bulls have played a huge part in his development and getting where he is now. "I got down here last year late and got my feet wet a bit," said Chorney. "This year, I have been playing a huge role with the Bulls. I don't have advisor so the first people to talk about me to the colleges were the Bulls coaching staff, Rocky Russo and David Nies. They did a great job of moving me on to the next level." Chorney said he owes a lot of credit to his family for supporting him through the good and tough times. "My parents have given me every opportunity that I could ask for and supported me through all of my injuries, bumps and bruises," he said. The coaches, players and teammates have also played a big role with me." Chorney said the work has only just begun for the next phase. "It's a vicious cycle to go from one of the top guys on your team and the next year you start from the bottom again," he said. "I'm excited for the challenge that is ahead and just improve my game every day." 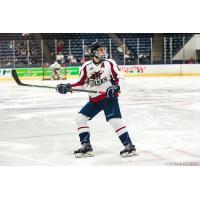 Marcus Chorney becomes the sixth Amarillo Bulls player on the 2017-18 roster to announce his NCAA College Commitment joining defenseman Brendon Michaelian (Robert Morris University), Austin O'Rourke (UMASS-Lowell), Cameron Bartkoski (Utica College), Trevor Micucci (Buffalo State) and is the the 14th overall joining Jason Brancheau (Ferris State), Brandon Bussi (St. Lawrence), Billy Duma (Air Force Academy), Luke Edgerton (Niagara University), Anthony Firriolo (Colorado College), Steven Ipri (Mercyhurst), Alex Truscott (Niagara University) and Brendan Furry (Niagara University). It's back on the road for Amarillo Bulls as they visit the Topeka RoadRunners at Kansas Expo Center Landon Arena tonight at 7:15 pm. Tune into the action live on CBS Sports Radio 1440, and online at www.amarillobulls.com, beginning with pre-game coverage 20 minutes before the puck is dropped. The Amarillo Bulls return home on Friday, Mar. 9 and Saturday, Mar. 10 to face the Corpus Christi IceRays at 7 pm at the Budweiser Bull Pen in the Amarillo Civic Center. Friday is family night with Family Four Pack for $44 (four tickets, four hotdogs and four sodas) and the Bring-A-Bud Pack for $22 (two tickets, two hotdogs and two sodas.) Saturday is Amarillo Youth Hockey Retro Night with the Bulls wearing special retro jerseys. A live auction follows immediately after the game with proceeds to benefit Amarillo Youth Hockey. Tickets are available at the Bulls Office located at 301 South Polk, Civic Center Box Office and all Panhandle Ticket locations including United Supermarkets or by calling 806-242-1122.